The security breach late Friday at the White House is prompting a new round of criticism for the Secret Service, with lawmakers and outside voices saying the incident highlights glaring deficiencies in the agency's protection of the president and the first family. 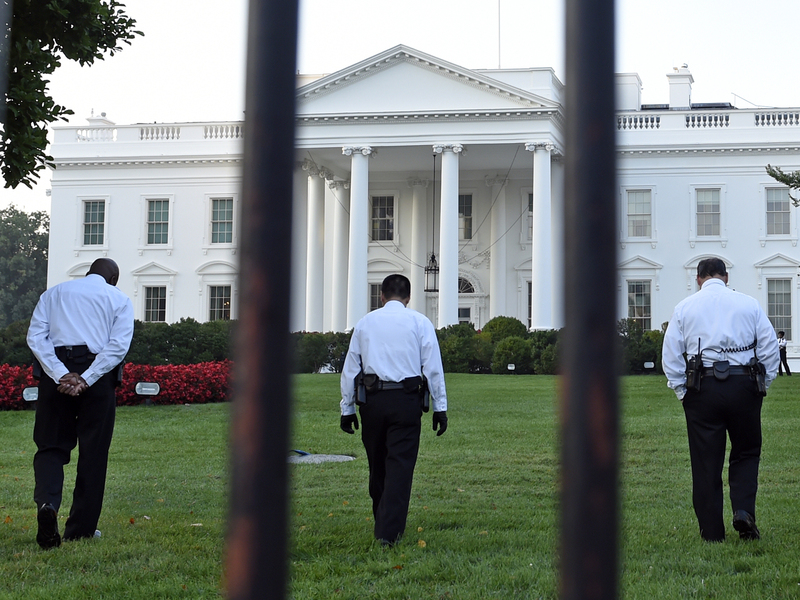 How did trespasser make it past White House front door? Just minutes after President Obama and his daughters departed for Camp David Friday evening, a man jumped the White House fence and sprinted across the North Lawn toward the residence. He was eventually tackled by agents, but not before he managed to actually enter the building. CBS News Chief White House Correspondent Major Garrett said criticism of the Secret Service, which has endured a number of black eyes in recent years, "will only increase" after this latest incident. Garrett highlighted some basic questions the Secret Service must answer: "Why wasn't the intruder tackled? How long was it before the intruder was detected? Did agents decide not to use dogs to stop the intruder?" Law enforcement officials have emphasized the need to balance the president's security with the free access rights of the public. One official told CBS News that Friday's breach should be considered "in context." "The family was not in residence, the individual didn't appear to have a weapon. He wasn't carrying any bags or a backpack," the official said. "The Secret Service has to be able to balance security with access and reasonableness. Closing Pennsylvania Avenue to pedestrians is not reasonable, but this access does result in fence jumpers periodically." But some in Congress are already highlighting the incident as the latest example of the agency's negligence. Rep. Jason Chaffetz, R-Utah, said the breach was "totally unacceptable," according to The Associated Press, and he accused the Secret Service of "failing to do their job." "These are good men and women, but the Secret Service leadership has a lot of questions to answer," he said. "Was the door open?" he asked. Kessler's book, "The First Family Detail: Secret Service Agents Reveal the Hidden Lives of Presidents," highlights a series of lapses and scandals at the agency in recent years. And Friday's breach, Kessler said, is emblematic of deeper managerial problems at the agency. "Because of corner-cutting and an ingrained cultural attitude by management of 'we make do with less,' the Secret Service is not protecting the White House with adequate agents and uniformed officers and is not keeping up to date with the latest devices for detecting intruders and weapons of mass destruction," he said. "The fact that the Secret Service does not even provide a lock for the front door of the White House demonstrates its arrogance." In a statement released after the man was apprehended, the Secret Service vowed to investigate the incident and review the agency's response "to ensure that proper protocols were followed." A Secret Service official told CBS News that the agency would look into all of the factors that prompted agents on the scene to decide against using force to prevent the man from entering the residence. The official also suggested the breach was not a consequence of inadequate staffing - that there were as many agents on duty Friday at the White House as there normally would be. In addition to its protective duty, Garrett emphasized, the Secret Service must also consider the consequences of overreaction. "If you have a jumper and he is unarmed and has no bags or backpacks or briefcase, do you unleash a dog and risk having cell phone video shot from Pennsylvania Avenue of an unarmed, mentally ill person being bitten or menaced ‎by an attack dog?" he asked. It may seem like a "trivial issue" compared to the safety of the president, Garrett said. But he recalled the criticism directed at the agency last October after a woman rammed her car into the metal bullocks near Treasury and then drove to the Capitol, where she was subsequently shot and killed. That incident even prompted a wrongful death lawsuit, he noted. The Secret Service is among the nation's most elite law enforcement units, but it has been beset by scandal over the last several years. In 2012, over a dozen agents and officers were involved in a prostitution scandal during Mr. Obama's trip to Cartagena, Colombia. And in March this year, three Secret Service agents were sent home from Amsterdam ahead of a presidential trip to that city after an episode involving public intoxication. An inspector general's report released last December found no evidence of widespread misconduct at the agency. Mr. Obama appointed Julia Pierson as the new head of the agency in March 2013, making her the first woman to hold that job. Some read the appointment as an attempt to turn the page on the recent embarrassments and change the culture at the embattled agency. After Friday's security breach, though, Pierson will have some explaining to do. And the stakes couldn't be higher, Kessler warned. "If the intruder were carrying chemical, biological or radiological weapons and President Obama and his family had been in, we would have had a dead president as well as a dead first family," he said. Late Saturday, the White House released a statement on Friday night's breach. "The president has full confidence in the Secret Service and is grateful to the men and women who day in and day out protect himself, his family and the White House," White House spokesman Frank Benenati said. "The Secret Service is in the process of conducting a thorough review of the event on Friday evening, and we are certain it will be done with the same professionalism and commitment to duty that we and the American people expect from the USSS."